Shimadzu, one of the world leaders in analytical instrumentation, has released the industry's first EDX-FTIR contaminant finder/material inspector. 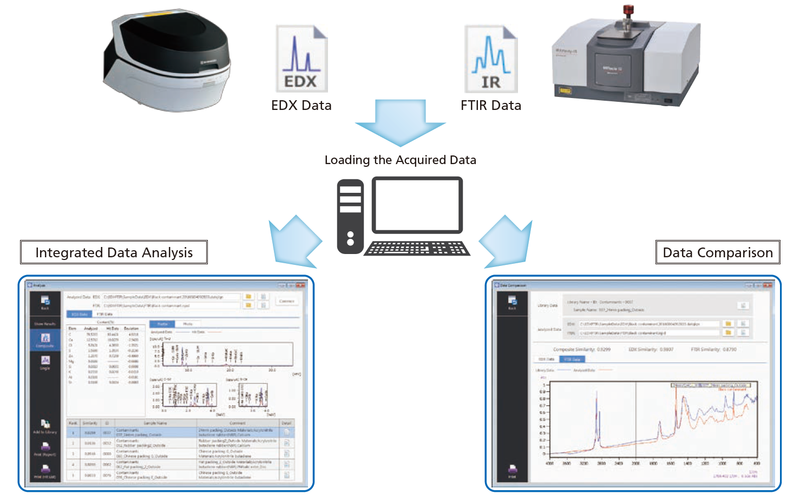 The EDXIR-Analysis software enables integration and analysis of data acquired from both an Energy Dispersive X-ray Fluorescence Spectrometer (EDX) and a Fourier Transform Infrared Spectrophotometer (FTIR). This proprietary software was developed by Shimadzu in order to meet the needs of users performing contaminant analysis and confirmation tests using EDX and FTIR. For contaminant analyses, data acquired with EDX and FTIR is integrated and analyzed using the new software. Previously, a separate analysis was required. By comparing the combined data with data present in a specialized contaminant library, candidate contaminants are identified. The new EDXIR-Analysis software runs on EDX-7000P/EDX-8000P instruments as well as on Shimadzu FTIR systems that can be controlled using LabSolutions IR/IRsolution control workstations. In recent years, manufacturers of food and chemicals as well as contract inspection organizations have seen an increased demand for analyses of contaminants. The importance of inspections to determine whether materials conform to specifications and are of the desired quality has also developed. At the same time, increased attention is being focused on EDX, which is suitable for the identification of metals and other inorganic elements, and FTIR, which excels in the analysis of polymeric materials and organic substances. Cases where the same sample is analyzed by both of these instrument types are also growing. However, as well as the need for separate analysis of the data acquired by each instrument, derivations from the data of the two instruments resulting in final identification are essentially left up to the analyst. Due to these factors, Shimadzu has received many requests for software that is capable of automatic analysis of data resulting from an integration of EDX and FTIR. Additionally, extra features were demanded such as the ability to integrate the analysis results acquired by two instruments and compare these results with standard data, and the ability to comprehensively store a range of files, including image files and reports. This EDX-FTIR contaminant finder/material inspector was designed to meet such needs. Newly developed search algorithms in combination with superior libraries give maximum benefit to the customer. Specified data acquired by EDX and FTIR is comprehensively analyzed using newly developed algorithms and checked against the contaminant library. In just a few seconds, a hit list is displayed ordered according to the probability of a match. The library contains practical information such as the material, color, shape and metallic luster of contaminants that have actually been detected. It can be expanded by adding new entries. The software greatly enhances the efficiency of analyses and reduces the burden placed on the analyst by eliminating some of the time-consuming work normally required. It thus provides strong support for the identification of contaminants. Specified data acquired by EDX and FTIR is compared with a selected data item in the contaminant library, and the respective degrees of matching are displayed. This function can be used effectively for inspection of incoming materials, when the compositions of the raw materials are already known, and as a countermeasure against "silent changes," whereby a supplier has made unauthorized changes in the compositions of raw materials. Since the software provides for the storage of image files and document files in PDF format linked to analysis data, a more paperless environment for a great variety of information can be established. By saving photographic data for analyzed samples and reports created using other analytical instruments, quick access to the necessary data can be obtained. Shimadzu has released the industry's first EDX-FTIR contaminant finder/material inspector. This EDXIR-Analysis software enables integration and analysis of data acquired from both an Energy Dispersive X-ray Fluorescence Spectrometer (EDX) and a Fourier Transform Infrared Spectrophotometer (FTIR). This proprietary software was developed by Shimadzu in order to meet the needs of users performing contaminant analysis and confirmation tests using EDX and FTIR. The new EDXIR-Analysis software runs on EDX-7000P/EDX-8000P instruments as well as on Shimadzu FTIR systems that can be controlled using LabSolutions IR/IRsolution control workstations.